The net-zero Agricultural Science Center features rooftop and ground-level solar, a wind turbine and a rainwater collection system. Photos courtesy of AISD. In its first year of operation, Arlington ISD's new state-of-the art Agricultural Science Center has proven to be a sustainable success story. The net-zero building, located at 2212 Michigan in Dalworthington Gardens, opened last fall. Today, the facility powered by a solar array and wind turbine produces more energy than it consumes annually. 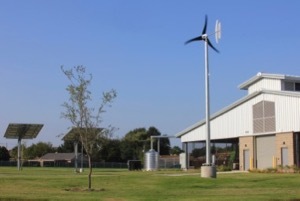 On sunny summer days, the Ag Science Center’s solar array produces about one megawatt of electricity, and the wind turbine produces about 1.7 kilowatts per day. None of the electricity is stored, so the Ag Science Center uses what it needs and then pushes any surplus onto the local power grid. 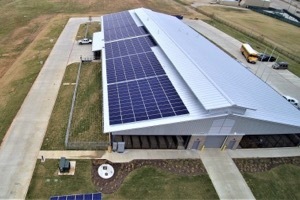 Equipped with a bi-directional meter, the Ag Science Center can also buy electricity from the grid whenever solar and wind are not producing enough, like at night. The facility also has four rainwater storage tanks and uses the collected water for irrigation and other purposes. Energy efficiency is now a major priority for AISD, Horn said. Since 2010-2011, ISD has reduced the amount of electricity it uses per square foot by 28 percent. With the 2014 Bond program, they recognized an opportunity to take their energy efficiency efforts a step further. “We wanted to bring something into the district that would be a teaching tool for the future,” Helm said. AISD worked with VLK Architects to design and build the facility. Good ventilation is key. One main corridor – wide enough for pickup trucks and animal trailers – runs the length of the building and has large garage doors on either end. That, combined with large fans and strategically-placed vents, ensures good air flow. LED lighting and high-efficiency HVAC equipment also keep energy consumption low. It was also designed with ag education in mind. The 23,000 square-foot building houses 54 flexible-fencing pens for goats and sheep, 14 heifer pens, rabbit pens, an animal exercise area, two large classrooms and a metal construction lab. The Ag Center is providing new opportunities for many Arlington students. “Because of the Ag Science Center, now students from all six AISD high schools can take ag classes,” said Ginger Polster, principal of the Ag Science Center and the AISD Dan Dipert Career and Technical Center. Classes at the Ag Science Center are already maxed out for the 2018-2019 school year with 559 high school students enrolled. The number of ag teachers in the district has grown from three to 10 in the last three years to keep pace with student course requests. But the district doesn’t view the Ag Center as just a high school building. The vision for the facility includes students of all ages. Elementary and junior high students will get to visit the Ag Science Center as well, experience agriculture and learn lessons like where their food and clothes come from. And they’ll learn about energy, electricity and conservation. As part of that vision, the entrance to the Ag Science Center features a 55-inch interactive touch screen that will soon display a dashboard showing the Center’s production and usage of energy. Students will be able to see in real-time how it all works. And since the Ag Science Center is sub-metered, the dashboard will show how much energy is being used by different building systems, like HVAC or lighting, at any given time. See how much energy the Ag Center produces on a daily basis. Stay up to date on everything green in North Texas, including the latest news and events! Sign up for the weekly Green Source DFW Newsletter! Follow us on Facebookand Twitter. Ryan Pierce is a communications specialist at AISD.